The last time I was in the confessional, I admitted to one of my deepest dreams as a writer: to pen a Star Wars novel. I’m still hoping that I’ll hear from Disney and/or Lucasfilm at some point. Thanks to everyone who tweeted about my desire. If you have a chance, can you go back to the other post and tweet again? Anyway, when I wrote that entry, I mentioned that I had done some Star Wars writing as well. And it’s kind of true, I have. This has been something that I’ve done a couple of times. Once, my younger brother and I worked on a Star Wars themed serial story. He would write a part, and then I would write a part, sending the file back and forth via our rickety old e-mail accounts (this was back in the day when both of us had dial-up, so you can imagine the fun). It was an interesting story that developed, about agents from the Empire and New Republic trying to find an implant that could make someone Force sensitive. I believe cybernetic professional wrestling was involved. I know I had a lot of fun writing that, especially the time I created a massive stand-off for my brother to resolve. Lots of guns and lightsabers pointed at different people. It was so ridiculous, my brother had to actually break out our old Star Wars action figures and set up a diorama to visualize what was going on. But the fanfiction I’m the most proud of is the Star Wars/Star Trek crossover story I created about twenty years ago. Allow me to explain: I was poking through the Internet (again, in the halcyon days before the Web 2.0 revolution) and I stumbled across one of the many fanfic repositories. I didn’t do a lot of exploring, but I did peruse a few crossover stories between the two franchises that I know and love. And I hated everything that I found. Seriously, it was mostly awful. I still remember one story: the Enterprise D somehow got thrown into the Star Wars universe, where it single-handedly disabled Darth Vader’s Super Star Destroyer (the one that’s as long as Manhattan). Data turned to the Dark Side. And William Riker became a Jedi, one who was able to lop off Darth Vader’s arm at the shoulder (and this without any training whatsoever). And a lot of the stuff I found was along the same lines: someone from one universe would be thrown into the other, and depending on the author’s preferred fandom, one side would dominate the other. It was clear that these authors were waging a sort of “my fandom’s better than yours” proxy war through their stories. Personally, I think comparing the two is an apples/oranges type of argument (one is space opera, the other is space fantasy). So I decided I wanted to write my own crossover fiction. But I decided to go in a slightly different direction, and I was inspired by two things. One was an image someone had Photoshopped of the Defiant flying with a group of X-Wings toward a Death Star. The other was something that Marvel and DC Comics were up to. Back in the late ’90s, Marvel and DC did this thing called the Amalgam Age of Comics. After doing a series of crossover battles between their biggest names (Hulk vs. Superman! Wonder Woman vs. Storm! 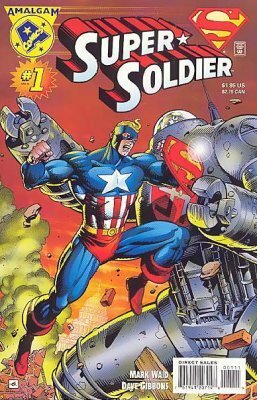 Captain America vs. Batman! ), they had their two separate universes merge together into one, their characters and storyworlds blending into something new. Superman was merged with Captain America to become the Super Soldier, Wolverine and Batman became Darkclaw, that sort of thing. I would occasionally poke through the issues, although I never bought any. But I had seen enough to be inspired to do something similar with the fanfic story I was writing. After doing some brainstorming, I wrote a story about the Star Wars and Stark Trek universes getting merged together through scientific chicanery in both universes. And boy, did I have a lot of fun with this. Jadzia Dax and Worf were bounty hunters, teamed up with none other than Boba Fett. Kyle Katarn and Jan Ors worked with the crew of Voyager to stop a threat to the New United Republic of Planets. Rogue Squadron was stationed at Deep Space Nine, where Tom Paris and Corran Horn competed with each other in everything. And then there was the final, cataclysmic confrontation between Luke Skywalker and Darth Vader, both of whom had been altered by beings from the Star Trek universe. I had a lot of fun with this story. And after putting it all together, I uploaded it onto one of the fanfic sites I frequented and waited for the accolades to pour in. I never heard a peep out of anyone. And you know what, that’s okay. It was a lot of fun. Unfortunately, I don’t remember which fanfic website I used. I’ve tried searching for it several times over the past few months, but no dice. So I guess those stories are lost to the ages. Oh, who am I kidding? I found them on my laptop’s archives around the same time I tracked down the spec scripts I wrote. And I spent an afternoon converting them over to PDF so I could share them with all of you. Now a word of warning: I only did cosmetic touch-ups to these stories (i.e. making sure that the paragraphs worked properly and reformatting it to be readable, redacting an old website and e-mail address that are no longer any good, etc.). I haven’t done any editing or rewriting on these stories. And these were written long before I started my “serious journey toward publication.” In other words, these are going to be bad. Horrible grammar? You’ll likely find it in here. Lots of infodumps to show off my creativity? Oh, yeah. Questionable stuff that should have been axed by a half-way competent editor? More than likely. But hey, the confessional is all about flaws, right? So if you want to see them, feel free. Ladies and gentlemen, I present to you the four-part Star Wars/Star Trek fanfiction crossover I wrote in the late ’90s, A Tangled Web. Brace yourself for the pain. Hi John, got my copy of “Hive” preordered today. Did you see this notice about a call for fanfiction in an oficial Star Trek Anthology(http://trekmovie.com/2015/10/09/the-star-trek-strange-new-worlds-writing-contest-is-back-get-your-fanfic-published-in-an-official-star-trek-anthology/)? Maybe it’s not too late to get something in.